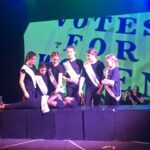 On Wednesday and Thursday evening this week, a packed Westwood Theatre was treated to a fantastic production by year 6, to commemorate 100 years of women’s suffrage in the UK. Suffragettes: The Fight! 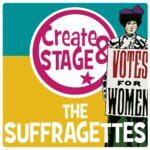 is a story of the struggle for women’s right to vote, looking at a range of important female figures in the movement, ranging from the reign of Queen Victoria up to the modern day. Through their English curriculum, Year 6 have adapted and made additions to the script. Throughout the process, the girls have been very eager to share their creative ideas on choreography, music and staging. Emotional, dramatic and inspiring in equal measure, each and every girl put on an excellent performance. 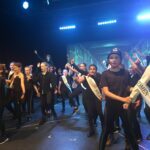 The production showcased the journey the girls have been on over the last term and brought together rousing songs, dynamic dance routines and impressive devised scenes. This production was a culmination of all their huge efforts this term. The Year 6 team would like to thank all members of staff who have supported the girls to bring this production to life. With special thanks to Mr Welch, Ms Duval, Ms Mitchell-Morgan and Mr Matthews. 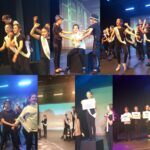 Congratulations to year 6 on their incredible and highly memorable performance… So much passion in their performances, and so proud. A fearless production – well done! We were honoured to welcome Gill Bridges as our Guest of Honour to Thursday’s performance. A RADA graduate and granddaughter of a suffragette, she enthralled us with recollections of her head-strong grandmother defying her husband and riding around in a pony and trap!